A Crunchy Baby Registry: 34 things you NEED (or should make) before baby comes. An alternative baby supply list for frugal moms, hippies, poor people, and mothers of oopsies. Patterns, recipes, and other ways to DIY your bundle. *Update: I received some feedback that this article was way too much to digest, so I have split it up into sections that are easier to read. What do I need before baby gets here? If you’re like me, you’re a worrier. And nothing gives you cause for worry like being pregnant. That nesting hormonal stuff kicks in and the anxiety starts, unless you have enough money to run out and buy everything you might need. But for most people that’s not the case. This baby registry for slightly crunchy moms is here to help. This is the precursor to that handy dandy baby instruction guide they never give you. Perhaps you have had a reversal of fortunes, maybe you have a surprise pregnancy that wasn’t in the budget. You could be a super bargain hunter, or want to minimize your consumerism. You could be a military mom or a single mom-to-be. You might follow the principles of simple living, or just want to educate yourself and make intentional decisions about your baby. Or you have less anxiety when you are prepared. Regardless you can be ready for a new baby without spending a ton of money. There are some things you really should have before the baby comes. Shopping is not something you will have a lot of time for after baby arrives. Although with the power of the hyperwebs you can do a lot nowadays. When I started having babies we had to shop uphill both ways, in a snowstorm, with no shoes… Nah, we had internet shopping back then, I just didn’t have any money. Regardless, if you know Murphy’s Law (anything that can go wrong, will go wrong), you know that if you are prepared for the unexpected everything will be fine. 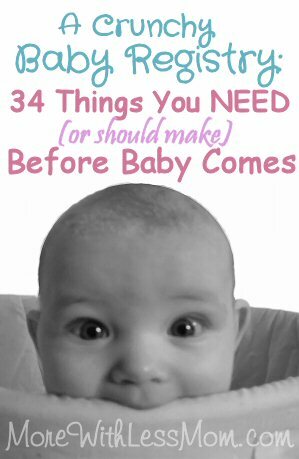 If you have a preemie you will need some special things, but if you have an earlier this list should cover the basics. This list is the minimum you should have in place. I tried to keep spending down while keeping the comfort of both baby and parents in mind. Once you have this list you can relax, all other needs can be addressed as you have time. If you are blessed with family and friends you should get many of these items at your baby shower. Many things you can make. Go window shopping at Babies R Us and a used baby stuff store to get a feel for the colors and styles that are out there, and the prices. Take a look at the different features of each item so you have an idea of what you want. Once you know what you want you can start looking for good stuff cheap. You can look online and compare deals and look for discount codes. Look on Craigslist or eBay for cheap used or new items. Join your local Freecycle group. Check yard and rummage sales. Post wanted ads on the local buy/sell Facebook group. Let the ladies of your church know you are looking for used baby items. There are many sources for the things you need while keeping spending to a minimum. Patterns for homemade alternatives. Patterns tend to be easy sewing patterns with lots of pictures, if it’s more than sew a straight line I need pictures. There aren’t any crochet or knit patterns because I have carpal tunnel, that stuff hurts me. Recipes for “green” options. Some recipes are green and all natural, some just have less stuff you can’t pronounce, some are cheaper. Recipes tend to be simple without ingredients too far off the mainstream. I tried to keep ingredients to things you could get at a whole foods store, grocery store, or a big box store. *I refer to babies as girls, the last three of my four were girls. No offense to boy babies everywhere, or the parents who shop for them. Replace with your favorite pronoun accordingly. This has been pinned 388,000 times! Woo hoo! Hello my beautiful pinners! What was the biggest way you saved money preparing for your little bundle? Great list! I like the MYO options. Thanks for visiting my page via Healthy, Happy, Green and natural! I’m only a few weeks away from welcoming my little guy into the world. I love this list. I also completely agree with making all natural baby stuff like wipes and baby powder to save money. Thank you for sharing! It’s always nice when what saves you money is what you want to be doing anyways! Thank you! It’s nice to know what goes into the stuff you use on your baby. I was excited to read your list, I am always looking for a good minimalist list of needs for baby. I was shocked that you would list formula as a “necessity”. The necessity should be a convenient list of breastfeeding support phone numbers (friends, LC, LLL). I am all about babywearing (DIY wrap, sling, mei tai with tutorials of many pictures!). But to say you are paranoid about ring slings – ? – for why? You imply they could hurt an infant?the all fabric, non-adjustable slings are a pain for newbies to fit and can be much more difficult to keep baby upright as newbie often think baby should be laying in them. I do think that a small supply of formula is necessary. If an emergency comes up there has to be something on hand to feed the baby. What if there was a problem and you couldn’t get home, and the power went out and your frozen breast milk wasn’t safe… I always think it’s best to be safe rather than sorry.